Are Parents Helping Or Hurting Millennials In The Workplace? One could argue that the Millennials were only slightly impacted by "Helicopter Parented" phenomenon and the influence their parents had on them had both a positive and negative impact on their workplace skills, whereas the Gen Z kids grew up when this style of parenting really took hold. This could account for so many of them relying on their parents to help them with career decisions. So how is that working out? The Millennial Generation has been under a microscope ever since they entered the workforce, approximately 10 years ago. But as that generation ages, and a new cohort of employees starts to enter the work world, there are some surprising differences in how this new "Generation Z" approaches their future, versus the Millennials. The oldest of Generation Z are now 22, graduating from college and university, and making decisions about their careers with a slightly different lens than their older siblings, the Millennials. Recent research done by Randstad and Morar Consulting Canada has revealed that the largest difference is in the amount of influence that close friends and family have on a Gen Z making a career decision versus a Millennial, at 68% vs 45%. One could argue that the Millennials were only slightly impacted by "Helicopter Parented" phenomenon and the influence their parents had on them had both a positive and negative impact on their workplace skills, whereas the Gen Z kids grew up when this style of parenting really took hold. This could account for so many of them relying on their parents to help them with career decisions. As parents of Gen Z'rs, both those entering the workforce, and those still in high school, how can we help them to better prepare for success, and become the leaders most (62%) of them say they want to be? One of the key areas of difference between Millennials and Gen Z's came out when the groups were asked about how their education prepared them for their current jobs, specifically in the areas of negotiating and conflict resolution. 32% of Millennials felt they had been prepared for negotiating by their education, while only 20% of Gen Z respondents felt this was true. In the area of conflict resolution 36% of Millennials felt they had this skill when they entered the workforce, while only 22% of Gen Z's felt the same. "Don't fight every battle for your child. If you are always settling their disagreements both at home with siblings, as well as at school with classmates, or even with teachers, you are not letting them find their own way to resolving conflicts." 1)	Conflict Resolution: Don't fight every battle for your child. If you are always settling their disagreements both at home with siblings, as well as at school with classmates, or even with teachers, you are not letting them find their own way to resolving conflicts. It can be tempting to step in when your child is having an issue with someone else, but unless they are veering to the violent or abusive in trying to find resolution, leave them to it. Particularly, don't step in to argue grades with teachers, when they can effectively argue for themselves and/or study harder the next time. 2)	Negotiating: Many children don't get the chance to effectively develop their negotiating skills if a) the people they're negotiating with always give in or b) they have others negotiate for them. Need an extension on a school project? That's up to them, not Mom or Dad. Whine, beg and plead for a later bedtime and get it without having to give up something else in return (you're up later? Do the dishes! ), that's just called winning all the time. Let them negotiate on real terms for things that are important to them. 3)	Speaking in front of a crowd: While kids can and should get plenty of experience doing this, you can help by not speaking for them when you're in a social situation. Expose them to appropriate adult situations and let them voice their opinion, naturally leaving room for them to consider others' opinions, which may result in some conflict resolution and negotiating of stances. 4)	Professional Etiquette: In a world of "Hey u", "IKR" and "TTYL" on text messages, etiquette reaches into how we spell, speak, and appear. Insist that your kids spell out words in full, with proper grammar, if they are texting or emailing you, so that it seems more natural in the work force. While the dress code for work and office situations has gotten more casual, it's still not appropriate in most places to turn up in sweat pants. Encourage your kids to dress for school and social situations. People develop a first impression in the first 10 seconds of meeting you. It's important. 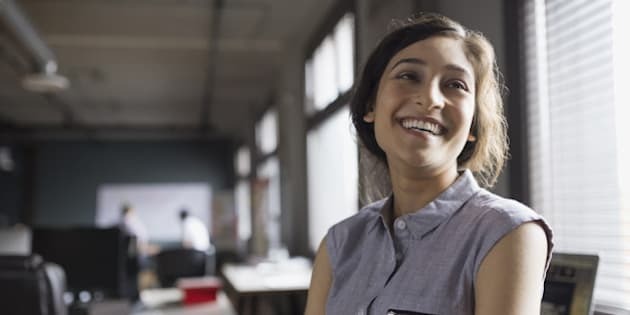 Both Millennials and Gen Z's, contrary to public opinion, believe that in person communication is the most effective way to engage with both coworkers and managers. Make sure you encourage them to do this with their friends, and yourself, instead of always resorting to texting or emailing. Gen Z's are very uncomfortable with picking up a phone when it comes to talking with their managers; teach them some phone skills by chatting with them by phone while they're away at school. Almost 60% of Gen Z's report that their Personal Skills are not good and only 3.6% have the confidence to say they are very good. Much of this training comes from home. Once a week, try to have a formal family dinner to show them what good table manners look like, have them come to the table with a current news event they're prepared to present, discuss, and defend. And if you're really feeling it, impose a dress code as well. *Research was performed by Randstad Canada, a Canadian leader for staffing, recruitment and HR Services.